Two lovely figures made with a lot of care. Note the headscarves, made of tissue. 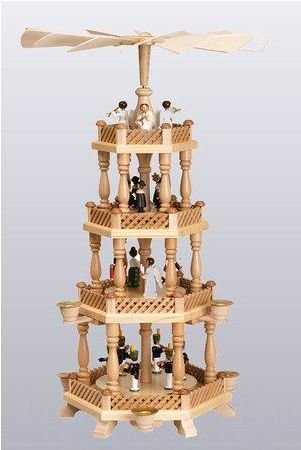 From Hennig Miniaturen, http://www.hennig-figuren.de/. 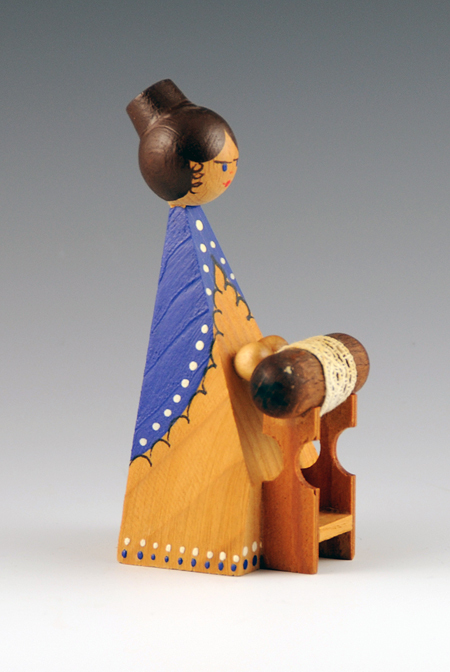 Lefthand standing figure is 6 cm tall, righthand seated figure is 5 cm – very small. 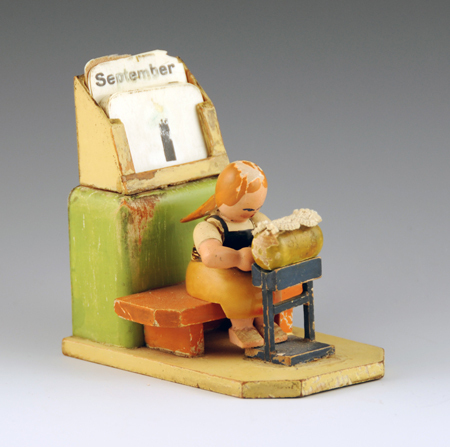 Generally around 3″ high, the miniature wooden figures from the German Erzgebirge area are delightful. 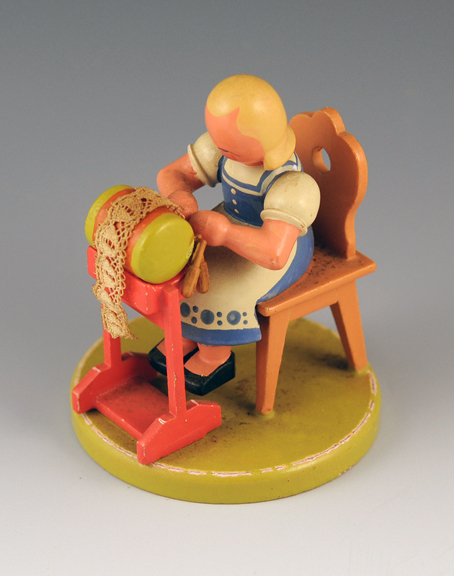 The klöppel figures are normally part of a set of figures representing many different trades – often for use in creche scenes. I am only showing a small sample of currently available figures – I keep finding more every time I search on the net. 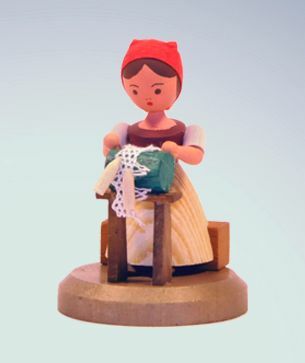 The lacemakers are often made in pairs – standing and seated. 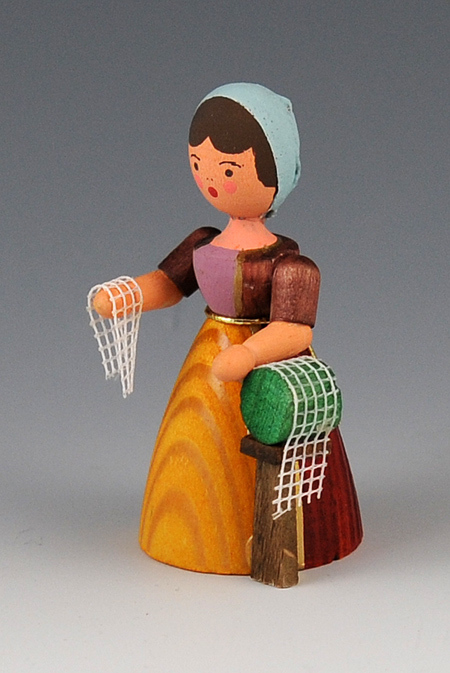 The degree of handwork in these figures varies a lot, although most are at least hand painted. There is also a wide range of quality – I’ve bought several that have arrived with broken parts, and it’s virtually impossible to glue them back together. Sometimes they are used in the German Christmas Pyramid structures (Weihnachtspyramide), as in the example on the left by Seiffener Pyramidenhaus. The ‘Christmas Pyramid’ may be a predecessor of the modern Christmas tree. Note the candleholders on this example – the heat from the candles will turn the fan on top, causing the various layers to rotate. 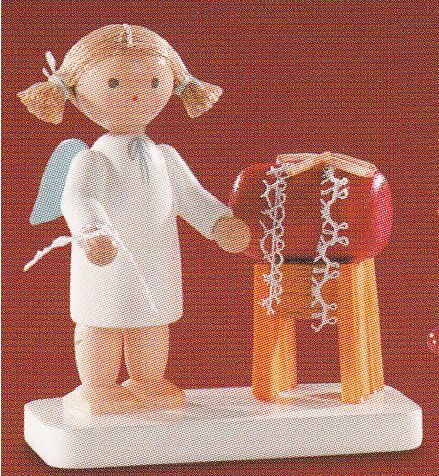 This one appears to have a klöppelfrau on the second level at the back (http://tinyurl.com/4hrxud5). A smaller, more modern interpretation can be seen at http://tinyurl.com/4w8alz3. As seen in the reference in the last sentence above, the smaller pyramids sometimes include flat cutout figures instead of three dimensional carvings (see another example at http://tinyurl.com/4uvxrhj). So let me digress a little to discuss the Schwibbögen and Fensterbilder. 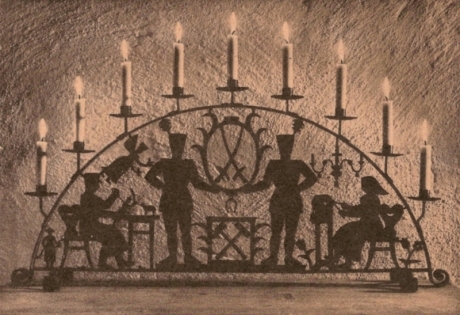 Schwibbögen are arched candle holders with cutout images, originally made from a single sheet of forged iron which could then be painted. 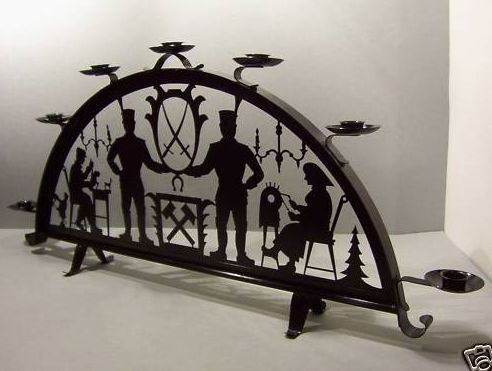 The first one was made in 1740 in Johanngeorgenstadt (see http://tinyurl.com/4r9wgw8 for an example based on the earliest design). The arched shape represents the view a miner would see on leaving a mine tunnel, and the lights are a reminder of darkness he has just left. The version with the lacemaker, a woodcarver, two miners, two crossed swords, two hammers, a Christmas tree, and an angel is the most famous. The graphic designer Paula Jordan (1896-1986, http://tinyurl.com/4ha8b2c) was commissioned to create the work in 1937 for the important Erzgebirge folk-art exhibiton “Feierohmd-Schau” held in Schwarzenberg (1937/38). The design became the symbol of the exhibtion. Schibböggen are quite impressive when backlit in a window at Christmastime. Modern versions are overwhelmingly made of wood, and many more designs are now available. Electrified versions are common. They are a specialty of the town of Seiffen. Left: The original Schwibbögen iron design by Paula Jordon for the 1937/38 Feierohmd-Schau exhibition. Right: A modern interpretation of the Jordan design in iron. This piece is unusual, most modern examples are now made in wood. http://tinyurl.com/49d8lnz (this one has fully carved figures – expensive but very nice). The topic of Schwibbögen naturally leads to the Fensterbilder – a smaller ornamental cutout meant to hang in a window. 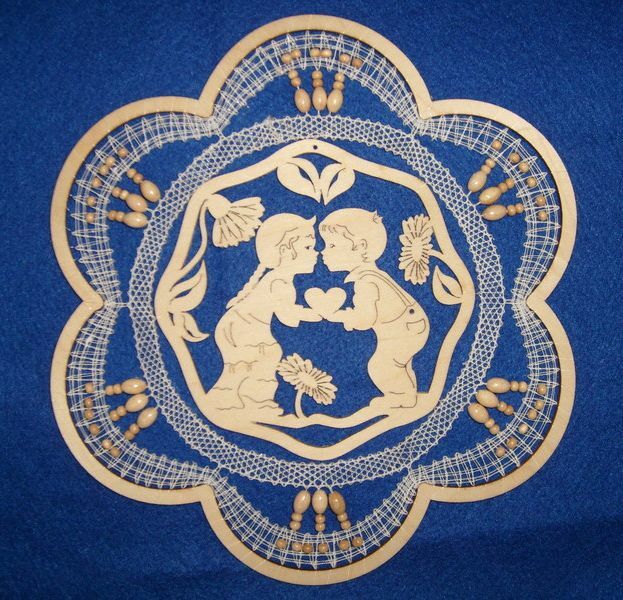 One can occasionally find the cutout of a lacemaker (http://tinyurl.com/4l3zt5g), but more often we see small frames or ornaments meant to be filled or worked around with bobbinlace. Bobbinlace motifs can also be used as fenstermotifs without any cutout supports. There have been several bobbinlace pattern books dedicated to this topic, such as “Fensterbilder mal anders” by Sabine Frank-Hart. Left: Thomas Müller (est. 1915). 4.5 cm high. 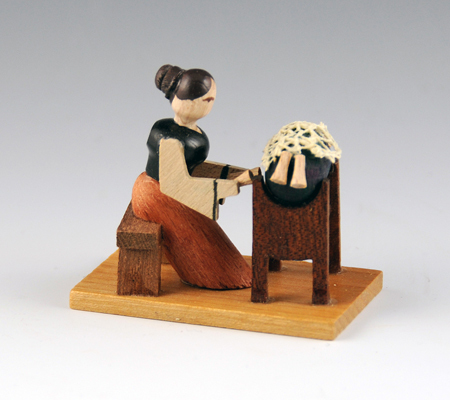 Right: 10 cm high – I don’t know the manufacturer. This figure also comes painted green. 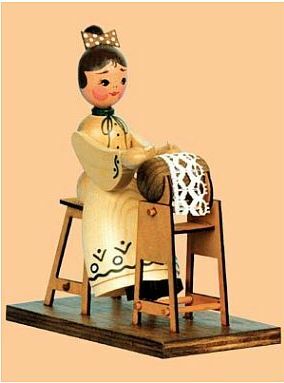 An angelic lacemaker, perhaps meant for Christmas. 2″ high, by Flade. 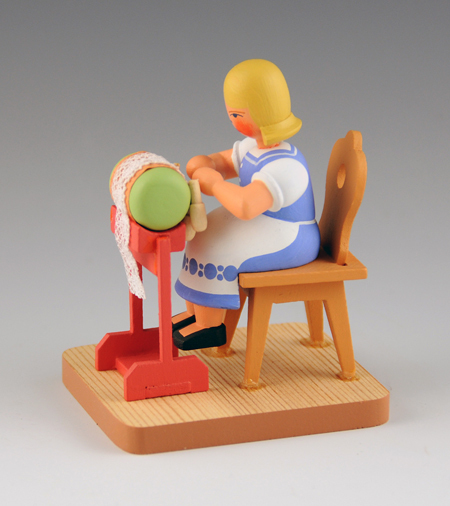 One of the oldest and most famous of the miniature wooden figure makers is the Werkstatt Leichsenring http://www.blumendrechsler.de/home.htm. 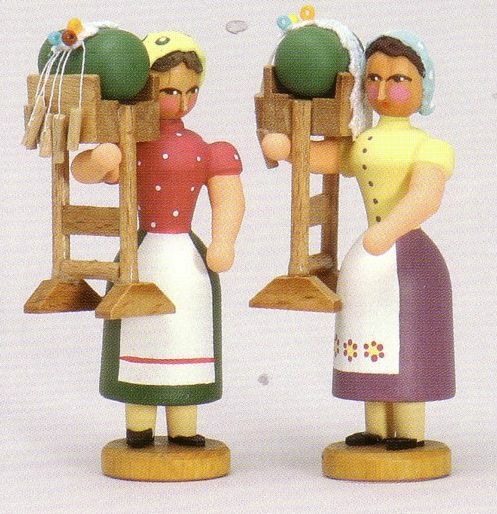 Their current Klöppelfrau and Klöppelmädchen designs are shown below. They are beautifully made. Werkstatt Leichsenring Klöppelfrau and Klöppelmädchen with a matt paint finish. The figures are about 3″ high. They have remained in excellent condition ever since I bought them. Now here comes the curious part. The older lacemaking figures from this firm had a shiny finish, see the lefthand figure below. When I bought this figure, I photographed it, then left it sitting on a table. In the morning I noticed a fine colored powder surrounding the figure in a ring on the table. As the day went on the ring got larger, always very fine particles. The paint was flaking off the figure, rather violently – I could see particles flying off and landing several inches from the figure. It was pretty unnerving when it happened. After a while (see the right hand figure), the paint had flaked off very badly, and all the glued parts were coming off. I finally put what was left into a plastic bag where the damage continues to this day. Shortly afterward I bought an older Klöppelmädchen (left hand photo, second row below). She suffered exactly the same fate. A third, even older figure is shown on the righthand side above. I think it dates about 1910, and has a calendar theme. It was in better shape when I first bought it, but now has a few areas flaking off, mainly in the hair. My only explanation is climatic – New Mexico is extremely dry, and my house is at 7500 feet above sea level. The older wood seems to be shrinking while the paint remains as is, hence the failure of the paint bond. If anyone has a better explanation, I’d love to hear it. And there’s a lesson here – photograph your figures quickly. You never know what the future might bring. Could the flaking paint be because of an incorrect restoration? It could be because someone painted with acrylics over oil paints, for example. I am particularlarly intrigued by the cross hatching visible on the base of the firnst figurine. It could also be the dryness but the rate of change seems high. 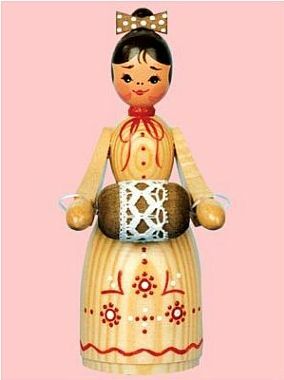 Both the Klöppelfrau and Klöppelmädchen are older figures(1950’s according to the seller) and I’ve seen other ones with this same shiny paint. I think the choice was original – but the company obviously has changed the paint in their more modern figures. So there might be somthing with that. The ‘crosshatching’ is just the grain of the wood on the base. It was amazing how fast this occurred. I’d say that the wood is too new & hasn’t been dried or aged long enough. The paint might also be water based & is absorbing the moisture from the air & flaking off. You could test a few flakes in a drop of water to see if it dissolves. One solution to the problem is to give any new acquisitions a coat of clear hairspray to seal the paint. I think that hooded bobbins were invented for lacemakers who lived in the coal mining areas of Germany. The coal dust in the air would have covered everything so with the hood covering the thread, the lace stayed cleaner. And then the finished lace was probably washed & starched when finished. The figures date from the 1950’s according to the seller – but perhaps there was something originally wrong with the wood – seems unlikely since this company has been around a long time, and a big problem would surely have been noticed. The newer figures do have a different paint. Typical humidity around here is about 8% or less, but there are fluctuations the few times a year it decides to rain. Good idea about the water-base paint – I’ll check it out with some of the flakes.